1 of 4 Using scissors, on each cup cut 4 slits, evenly spaced, from top to bottom. Tape slits closed with masking tape on outside of cups. 2 of 4 Place chopped chocolate in medium-size microwave-safe bowl. Microwave on high power for 1-1/2 minutes. Stir; microwave another 30 to 60 seconds or until almost melted. Stir to melt completely. Let stand about 1 minute or until temperature is about 115 degrees F on instant-read thermometer. 3 of 4 Place 2 heaping tablespoons melted chocolate in one cup. Swirl to coat inside of cup; use pastry brush to evenly coat. Place cup, open side up, on waxed paper-lined baking sheet. Working quickly, repeat with remaining 7 cups. 4 of 4 After 5 minutes, rebrush chocolate evenly in cups. Place on waxed paper, open side down. Refrigerate while continuing. 1 of 1 Place remaining melted chocolate in small resealable plastic food-storage bag. Snip very small hole in one corner. On another waxed paper-lined baking sheet, pipe 8 handles in shape of letter D, about 1 inch high. For stirrers, on waxed paper, pipe 8 lines about 1-1/2 inches long and about 1/4 inch thick. (Make extra handles and stirrers to allow for breakage.) Refrigerate 15 minutes or until chocolate is firm. Reserve chocolate-filled plastic bag at room temperature. 1 of 2 Remove masking tape from cup. Carefully peel cup away from chocolate. Gently pop bottom of chocolate cup from the paper cup. Repeat process. 1 of 2 In small saucepan, heat 3/4 cup heavy cream until small bubbles appear around edge of pan. Place chopped chocolate in large bowl. Pour hot cream over; let stand 1 minute. Stir until chocolate is melted. Stir in liqueur. Let cool 10 to 15 minutes or until mixture registers 80 degrees F on instant-read thermometer. 2 of 2 In large bowl, beat remaining heavy cream on medium-high speed until stiff peaks form. 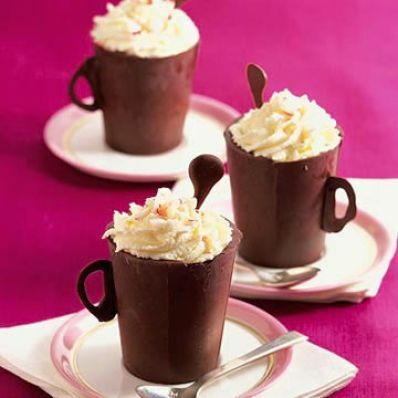 With whisk, stir about one-quarter of whipped cream into chocolate mixture to lighten. Gently fold in remaining whipped cream. Cover; refrigerate at least 2 hours or overnight. 1 of 1 Spoon mousse into large pastry bag fitted with large star tip; pipe into cups. (Cups can be filled 3 hours ahead; refrigerate.) Garnish with stirrers, and candy, if desired. Makes 8 cups. Per Serving: 7 g pro., 810 kcal cal., 6 g fiber, 37 g sat. fat, 131 mg chol., 80 mg sodium, 61 g Fat, total, 59 g carb.